The first medals of the 2016 Olympic sailing regatta were decided today as both the men’s and women’s RS:X classes held their final races following a postponement due to light winds. Meanwhile, in the Finn class, U.S. sailor Caleb Paine is back in contention for a medal after successfully petitioning to overturn his disqualification in Race 6 last Thursday. U.S. women’s 470 sailors Annie Haeger and Briana Provancha are also continuing to have a very strong regatta and remain well within striking distance of gold going into the last day of their class preliminaries. 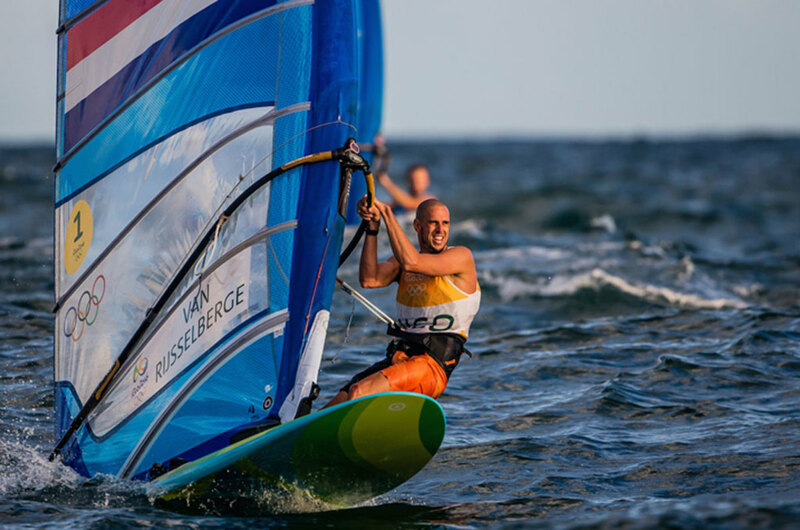 In the men’s RS:X classes there will little suspense as to who would get the gold with Dutch sailor Dorian Van Rysselberghe having dominated throughout. As an indication of how well he did, his throw-out was a 6th place in the second to last race of the series. It was the same thing with British sailor Nick Dempsey, who took silver. By contrast, the battle for bronze was down to the wire, with French sailor Pierre Le Coq edging out Polish sailor Piotr Myszka by a mere two points. In the women’s RS:X class, the picture was far less clear with no less than six of the 10 sailors taking part in the final medal race in a position to score a medal. To make matters that much more agonizing, the racing conditions were marginal throughout the final race, with wind velocities varying dramatically at different points on the course, forcing the competitors to pump their rigs like crazy on occasion to keep moving, including across the finish line. In the end, it was France’s Charline Picon who came out on top, with China’s Peina Chen right behind her in second and Russia’s Stefania Elfutina coming back from a penalty at the start to win bronze. The emotion showed by all three medalists afterward served as a testament to just how tough a race it was. Among U.S. sailors, Caleb Paine seems to have taken some inspiration from the race committee’s favorable decision earlier this weekend, finishing 10th and 4th on Sunday, and vaulting into 4th place overall with a rest day tomorrow and the medal race on Tuesday. While a gold is out of reach with British sailor Giles Scott having wrapped things up with a race to spare, just five points separate Paine from Croatia’s Ivan Kljakovic Gaspic, currently in third. Sweden’s Max Salminen is also right behind Paine with a 74-point overall score as well. In the women’s 470 class, Haeger and Provancha made a real statement today, finishing in 5th and 2nd in their two races, which jumped them into second place overall just four points behind Britain’s Hannah Mills and Saskia Clark. Consistency is everything in a series like the Olympic regatta, and their overall record is now 7, 3, 10, 2, 5, 5, 2. In the men’s 470 class, U.S. sailors Stuart Mcnay and David Hughes now stand in 6th overall and look to be in good shape for making the medal round. Tomorrow will be the last day of preliminary racing in both 470 classes. After that comes a rest day and then the medal race on Wednesday.